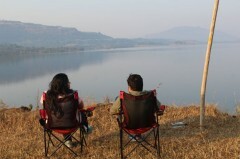 Spend a night camping at Bhandardara and surround yourself with the peace and tranquillity of nature. 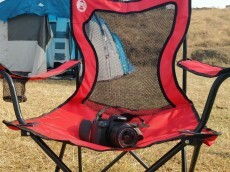 You can explore the scenic delights at the campsite and reconnect with your friends or family around a bonfire. You can spend your evenings going on rejuvenating nature walks, dip your feet in the waters of Lake Arthur or just sit back and watch the golden sun dissolve into the lake. At night, you will gather around a crackling bonfire with the rest of the campers and munch on delicious starters and snacks. After spending a restful night huddled in comfortable tents, you will wake up the next day to a beautiful sunrise. Hop onto boats and embark on a ride on the still waters of Lake Arthur. 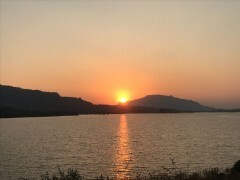 Perfect for a weekend getaway from the city, this camping experience at Bhandardara is ideal for those who want to escape into nature and indulge in the picturesque delights of Bhandardara. Tucked away in the forests of the Sahyadri Mountains, Bhandardara is a renowned camping destination near Igatpuri. With rolling hills standing tall to the backdrop of clear, blue skies, this a perfect destination for campers looking to escape into nature and spend a relaxing weekend. Your tents will be pitched on the open grounds just outside the Murshet village overlooking the vast expanse of Lake Arthur. The tents will be equipped with comfortable sleeping bags and air pillows to ensure a restful night’s sleep. Wake up to a photogenic view of the Lake Arthur and embark on a boat ride over the lake for a fitting end to your weekend getaway. 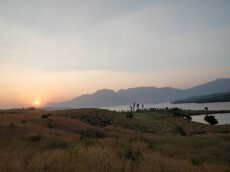 • Spend a night camping at Bhandardara. • Embark on a boat ride across Lake Arthur. A basic level of health and fitness is required to book this camping trip in Bhandardara This is a non-strenuous activity. However, if you have any cardiac or respiratory conditions, or suffer from knee or spinal problems, please consult your doctor before booking this trip. 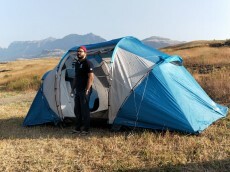 Travellers are required to adhere to the instructions of the tour guide while undertaking any adventure activity during this camping trip in Bhandardara. 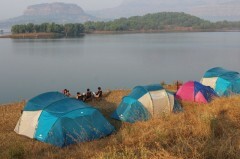 Cancellations made more than 3 days prior to check-in date of camping in Bhandardara: Full refund. 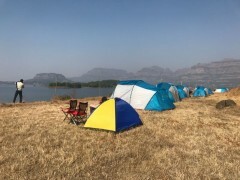 Cancellations made on or less than 3 days prior to check-in date of camping in Bhandardara: No refund. Please note that check-in time for the campsite is 15:30 hrs and check-out time for the campsite is 11:30 hrs. The tour operator takes utmost care to ensure safety of the travellers and shall not be held responsible for any mishap, accident or loss of life during the trip. Swimming or boating at Lake Arthur is at your own risk. Jain food can be served at the campsite, only if requested in advance of check-in date. Prices mentioned may be subject to a premium on holidays, festivals and long weekends. 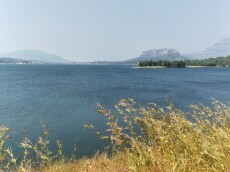 Day 1 of Camping in Bhandardara: Check-in and enjoy! Arrive at the campsite by 15:30 hrs and check-in to your allotted tents. Spend the afternoon at leisure by exploring the campsite, going on a quick run by the lake or playing games at the campsite. Enjoy some high tea in the evening and reconnect with your friends or family. At night, you will gather around a bonfire with the rest of the campers and munch on some starters. Dig in to a dinner and spend a night in your tents. 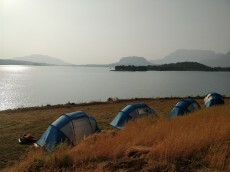 Overnight at Bhandardara in tents. Fellow campers enjoying the view. 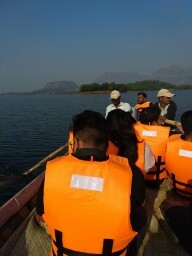 Day 2 of Camping in Bhandardara: Boating and check-out. Wake up to a beautiful sunrise and spend some time relaxing on the banks of Lake Arthur. Practise some meditation or go for a rejuvenating jog. You will be served breakfast and tea by 08:30 hrs. After breakfast, you will hop onto boats for a ride on the peaceful waters Lake Arthur. Bid your farewell to your fellow campers and check-out by 11:30 hrs. Your trip ends here. Overnight at Bhandadara in tents. Arrive at the campsite and check in by 15:30 hrs. 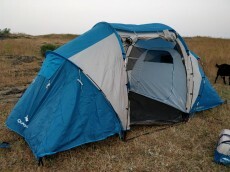 You will be accommodated in spacious tents on a twin/multi-sharing basis. You will be provided with sleeping bags, air pillows and camping chairs. The campsite is equipped with common kitchen/dining tents and toilet tents with clean western toilets. Today's meal package includes evening tea, snacks/starters at bonfire and dinner. Meals will be a buffet served at the campsite. Outside views of your camp tent. Wake up to the chirping of birds and a beautiful sunrise. Today's meal package includes breakfast served with tea. After a session of boating on Lake Arthur, check-out by 11:30 hrs. Your trip ends here. 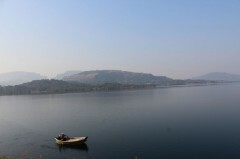 Bhandardara is accessible via road from Mumbai (180 kms), Pune (200 kms) and Nashik (80 kms). Alternatively, you can also board a train from Mumbai to Kasara and take a taxi to Bhandardara. The campsite is located 5-km away from MTDC Resorts.